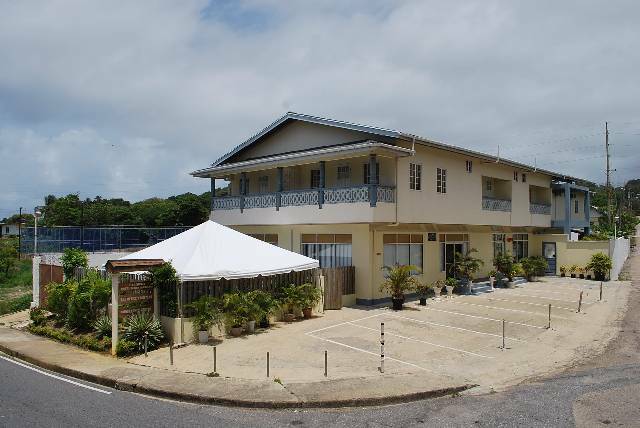 A twelve (12) bedroom fully furnished hotel, ideally located opposite a safe semi private beach and two minutes walk from a Grocery and Bar is offered for sale. The Hotel which was constructed in 2006 comprises of two (2) master suites with large balconies overlooking the ocean, eight (8) double occupancy rooms, each containing their own private bathrooms, a lobby equipped with Direct TV installation, Refrigerator, Microwave and seating accommodation. The ground floor contains two bedrooms with an adjoining bathroom, conference room which seats 20 persons, internet cafÃ©/ stationery store, a restaurant with a fully equipped kitchen, loading ramp and laundry room. Utilities include: Electricity, Internet and Telephone service. There is also potable water and 2400 gal reserved water tanks with pumps to supply the hotel. TT$ 9,000,000. or US$ 1,500,000. Negotiable. This listing has been viewed 2663 times.